- Updated: 01/23/18 .. see about topic updates. The nation's 382 metro areas contained approximately 277.1 million people in 2016, representing approximately 86 percent of the nation's population. This was an increase of approximately 2.3 million people from 2015. The nation’s 551 micro areas contained approximately 27.7 million people in 2016, representing approximately nine percent of the nation’s population. This is an increase of approximately 16,000 people from 2015. Use the county interactive table to examine metro by county demographic change 2010-2016, the how and why of change and what these patterns suggest about the future. Use the CBSA/metro interactive table to examine metro demographic change 2010-2016, the how and why of change and what these patterns suggest about the future. Updates ... this report updates frequently. Selected updates are listed below. Register to receive update notifications. Population. The total population of Washington-Arlington-Alexandria, DC-VA-MD-WV MSA changed from 5,666,655 in 2010 to 6,131,977 in 2016, a change of 465,322 (8.2%). Among all metros, Washington-Arlington-Alexandria, DC-VA-MD-WV MSA was ranked number 6 in 2016, based on total population. It ranked 7 based population change from 2010 to 2016 and ranked 76 based population percent change from 2010 to 2016. See section 4. for additional details on population. Personal Income. The total personal income of Washington-Arlington-Alexandria, DC-VA-MD-WV MSA changed from 329,497,452 ($000s) in 2010 to 409,203,181 ($000s) in 2016, a change of 79,705,729 ($000s) (24.2%). The per capita personal income changed from $58,147 in 2010 to $66,733 in 2016, a change of $8,586 (14.8%). See section 6.1. for additional details on personal income. Gross Domestic Product. This metro ranked number 8 among the 382 MSAs based on 2016 per capita real GDP. The real per capita GDP changed from $75,227 in 2010 to $73,270 in 2016 a change of ($1,957) (-2.6%). .. Real GDP The real GDP changed from $426,285M in 2010 to $449,293M in 2016 a change of $23,008M ( 5.40%). .. Current $ GDP The current dollar GDP changed from $431,293M in 2010 to $509,224M in 2016 a change of $77,931M ( 18.07%). .. Quantity Index The all industry GDP quantity index changed from 103.802 in 2010 to 109.405 in 2016 a change of 5.603 ( 5.398%). GDP is the most comprehensive measure of metro economic activity. GDP is the sum of the GDP originating in all industries in the metro. See section 6.5. for additional details on GDP. Employment Situation (updated monthly). The Washington-Arlington-Alexandria, DC-VA-MD-WV MSA labor force changed from 3,333,272 in November 2016 to 3,380,530 in November 2017, a change of 47,258 (1.4%). The unemployment rate changed from 3.58% in November 2016 to 3.63% in November 2017, a change of 0.05 (1.41%). See section 6.7. for additional details on the employment situation. Cities are places of population concentration. Incorporated cities have governmental powers assigned by the corresponding state. Metros, or CBSAs, contain one or more incorporated city. The Census Bureau develops annual estimates of the population for all cities using a model-based estimatin procedure (in contrast to sample survey-based population estimates developed through the American Comunity Survey (ACS). The model based estimates developed for all cities time lag of only a little over a year. In contrast, the ACS-based estimates for cities under 65,000 population have a time lag of four years and are estimates for a 5-year time period. For example, in January 2018, the 7/1/16 estimates are the most recent model-based population data for all cities, whereas the 2016 ACS estimates (centric to mid-2014) are the recent ACS-survey population estimates for all cities. Places, the more general term for places of population concentration, includes incorporated cities and census designated places (CDPs) .. approximately 29,549 areas. Postcensal population estimates are not developed for CDPs. All counties time series population estimates interactive table. Based on the FHFA (Fannie Mae/Freddie Mac) Housing Price Index (http://proximityone.com/hpi.htm), these non seasonally adjusted data provide insights into movement of single-family house prices. The data are updated quarterly and feature a short lag between the date of availability and quarterly reference date. See related interactive table to compare areas. 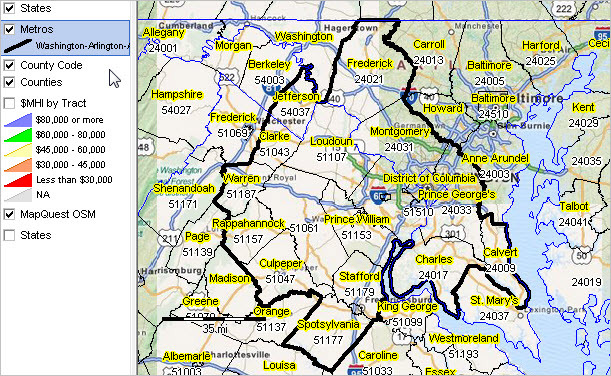 See related 5-Digit ZIP Code HPI interactive table. 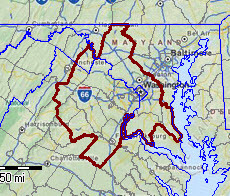 Based on Census County Business Patterns (http://proximityone.com/cbp.htm), these place of work data include all sectors except crop/animal production; rail transportation; postal service; pension, health, welfare & vacation funds; trusts, estates & agency accounts; private households; public administration. Most government operations are excluded. ... this section updates with 2016 data in April 2018. ... this section updates with 2017 data in November 2018. The Fortune 1000 companies (http://proximityone.com/fortune1000.htm) are the largest businesses in the U.S.
 American Capital Agency Corp.
 Beacon Roofing Supply, Inc.
 Booz Allen Hamilton Holding Corp.
 Delta Tucker Holdings, Inc.
 Hilton Worldwide Holdings Inc.
 Host Hotels & Resorts, Inc.
 The Carlyle Group L.P.
- Updated monthly. Not seasonally adjusted. - Table shows most recent six months and data for month one year earlier (data col 2) than most recent month.